I've recently gotten a lot of requests to do a kosher week. Being the giver that I am, I of course agreed and set to work on planning one out. And since it is Passover time, I thought that I would do kosher week based around that. 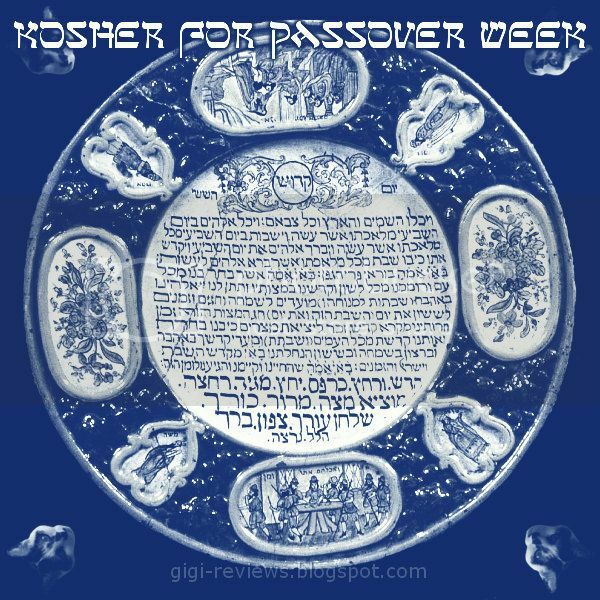 For those of you who may not know what Passover is, it's an eight-day Jewish observance that commemorates the Jewish slaves who fled Egypt under the reign of the Pharaoh Ramses II. Honestly, the shortest, easiest way for me to explain Passover might be to suggest you go rent The Ten Commandments, skip to about the middle of the movie, and let Charlton Heston do all the heavy lifting -- but I am going to give this a shot anyway. I warn you in advance: I may not be 100% accurate on everything, and I am of course going to throw my own touch on things. For more detailed and in-depth info, I suggest speaking to a Jewish friend, your local rabbi, or checking out a site such as chabad.org. Basically, after the Israelite slaves lived some pretty miserable lives (as we all know, slavery is not exactly a trip to Disney World), a Jewish man named Moses (played by good ol' Charlton Heston in the movie) -- much like the Blues Brothers many centuries later -- was given a mission from G-d. ("G-d" is not a typo, BTW: it is Jewish custom not to write out the name of God or the Lord in full, because if it is written it may also be destroyed, erased, etc. Thus it could possibly be considered to have taken the Lord's name in vain, which is forbidden by the Commandments. So, out of respect, I am keeping it real). Pharaoh: Well then, I'll answer nicely...NO! Moses: Yeah well, do it or you'll be sorry! Pharaoh: What part of "NO!" didn't you understand, little man? Moses: Do it or there is gonna be some serious smack laid down from above! Moses: Oh, it is on! It is on like Donkey Kong! To protect them and to convince the Pharaoh to set them free, the Jews were told to mark their homes with lamb's blood so they wouldn't be afflicted. (They were also allowed to eat the meat of the lamb, but there were specific rules for it -- and it's best to Google that for yourself, or we will be here all of eight days.) This is actually how the holiday came to have its name, because the homes of the Jews were "passed over." Moses tried talking sense to the Pharaoh after each plague, but Pharaoh held his ground until the last one. By then, even he had had enough, and he finally agreed to let the slaves go...well, sort of. A Seder has its own set of rules for what can and can't be eaten. First, before Passover commences, the house must be cleansed of all foods containing yeast (chometz). The chometz can be eaten before Passover begins, or can be given to non-Jewish friends. Or it can simply be burned. No yeasts or leavening can be eaten during Passover. (This is to commemorate the fact that the slaves fled with only unleavened dough). Of course, all of the food you could consume would be kosher (check out this link for an explanation of what kosher means). But because the holiday food additionally must not contain any chometz, anything consumed during Passover (assuming it's a commercially made product) must be specifically marked as "Kosher for Passover." Basically, think of it like this: Kosher for Passover compared to just kosher is like what Batman is to Bruce Wayne. They are both the same guy, but when he's Batman there is a little extra somethin' somethin'. * Charoseth. A mix of chopped walnuts, wine, cinnamon and apples. Its purpose is to symbolize the mortar that the slaves made to make the Pharaoh's bricks. On a personal note, this is actually my favorite part of the plate. I have had some homemade versions that were excellent. * Salted Parsley. This symbolizes the tears of the slaves, and also spring. * Hard boiled egg. Spring once again. * Shank bone. This represent the lambs that were sacrificed for their blood and their meat. * Bitter herbs. Every Seder I have been to has served horseradish, although other bitter/pungent items are sometimes used instead. It symbolizes the bitterness of slavery. My original thought had been to do reviews of the items on the Seder plate. But the items are pretty basic, and it's not like there are many shank bone goodies hanging around on store shelves. Instead, what I have decided to do is to focus on individual items that are commonly served at a Passover dinner, be it as a dessert, side item, or drink. All of the items are not only kosher, but are specifically kosher for Passover. I also tried to use things that are readily available nationwide (in the U.S. at least). I could have done more specialized items, but I wanted to be able to share some things that most people have probably at least heard of, if not seen or tried. So with that, let's eat! Thank you! Thank you both- I will be here all week! Natalie: I am saving my personal favorite item as the last review of the week- that will be one to not miss!